What it’s about: Chaos is holed up in the projection booth in an abandoned theater in Hatfork, Wyoming. He’s become a bit of a de facto public enemy in the aftermath of whatever happened—nuclear fallout, plague, civil war, who knows—but his position is all Kellogg’s fault. Kellogg runs the supply trucks but he also runs the dreams. When every citizen, be they human or slightly unhuman, closes their eyes, they all dream the same dream, in which Kellogg is often a mythical hero and Chaos an archetypal villain. Though Kellogg insists that Chaos is critical to the balance of their fragile post-apocalyptic existence, Chaos decides to press west, hoping to discover who or what else is out there and finally dream his own dreams (literally). With Melinda, a girl covered in fur, Chaos sets off on a road trip across the country, discovering that Kellogg isn’t the only one dreaming realities. Everywhere he goes he finds alternative societies and versions of “what happened,” but no one seems to be able to pinpoint when or how the change occured. Dreams seem to envelope the nation and Chaos (if that is his real name) just wants to find the lakeside house he remembers from before it all, where he was once happy and in love. Dreams have always fascinated me, so Lethem’s take on the theme along with the post-apocalypse element immediately peaked my interest. He creates fascinating insular worlds and the mystery of Chaos’s background permeates the novel. The book was engaging and intriguing, and I easily became immersed. Chaos is also a fascinating character, in some ways at odds with his own mind. His journey works on both a personal and societal level—he’s not just trying to find out what happened to the world, he’s trying to find out what happened to himself. My one complaint would be that though Lethem presents many visions of the future, we don’t ever truly arrive at explanations and the conclusion of the novel is open-ended, many earlier threads never carried to their conclusion. I thought the last quarter of the book was the weakest, a sort of digression from the earlier setups in the novel and also a kind of anti-resolution. Still, I wouldn’t let that deter anyone from picking up Amnesia Moon. I think some people would be perfectly satisfied with the ending, because it does come with a build-up in dramatic tension and leads to an important decision and future course for our main character. I just felt we didn’t get the payoff of earlier questions in the novel and I was left wishing that the problems Chaos had explored from the beginning came to a deeper resolution. Would I recommend? Yes. 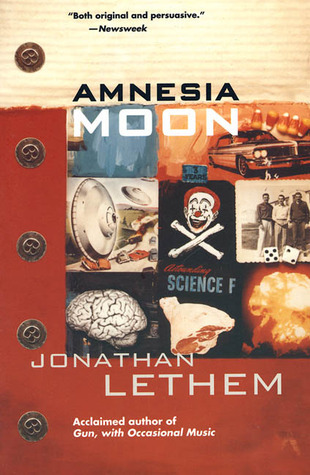 I really enjoyed Lethem’ style and I would read more of his books. He touched on two themes that intrigue me—the apocalypse and dreams—and treated both in a way I hadn’t seen quite done before.